As of the writing of this post one suspect is dead and the other one has just been apprehended. I didn’t think I would have anything to write about on the subject of the Boston Marathon bombing. I wasn’t there, I didn’t know anyone running. I never run anywhere myself if I can help it. Just as everyone else in our country, I’ve been glued to my computer or radio, waiting for the latest update. And because news is now so immediate, so up-to-the-second, there has been a constant stream of information. We even had photos of who the bombers were. But we didn’t know who they were until this morning. Through all the news reports I kept hoping they were not foreign terrorists or connected to foreign sources. I wanted the terrible people who committed this unspeakable act to be homegrown nuts. Like the Elvis impersonator who sent out the ricin laced envelopes. Like the Unibomber, or Timothy McVey in Oklahoma City or Eric Rudolph at the Atlanta Olympics. 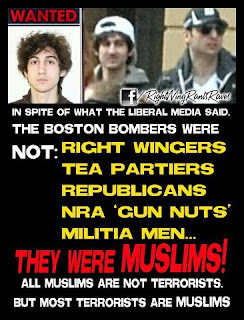 Because its easier to move on if the bomber is one of our own. It is easier for us to collectively move past the event, shake our heads in disgust or sadness or disbelief, and then move on because we think the homegrown nut is just that. Just a crazy anomaly. Just an unstable person making a completely horrible, and completely irrational decision. But when it turns out the bomber is not "one of us". 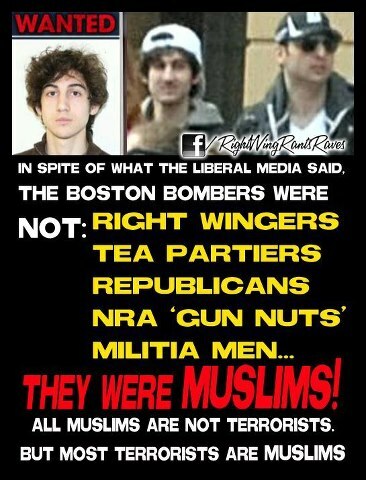 When it turns out he's from another country and Muslim on top of it, well then the bomber becomes the enemy. He becomes someone we can hate and hate and hate some more. He becomes a horrible stereotype that we can hold onto and focus our angry energy on. This makes me sad for a lot of reasons, but mostly for a personal one: my kids are foreigners and I don't want them to grow up in a country that hates and fears foreigners. I want the United States to be better than that. I want our citizens to be better than that. A couple of hours ago I saw this picture posted on Facebook. It was reposted by someone from the "Unofficial Michael Savage Fan Page". It made me a little sick to my stomach. Throughout our history as a nation we have found a place to focus our hate. On immigrants at the turn of the century, on Asians during World War II, on blacks during the time of slavery and on through the civil rights movement. Now we can hate Chechnyans. And we can hate Muslims even more. So so sad. At this moment we don't know why these young men made the horrible decision that they did to set off bombs and kill innocent people. We may never know. But amid the celebration and relief that I feel for the people of Boston, I feel very sad for these boys father and family and friends. They are suffering loss and feeling guilt as well. And I feel very sad for all the "foreigners" here and abroad who will bear the brunt of our collective national anger.